BED SCARF GOLD N°24BED RUNNER "BLUE NIGHT"
This classical and timeless set of table linen is composed of table runner and napkins in pure cotton. Inspired by a drawing of the eighteenth due to the textile designer Ana Maria Garthwaite, this sumptuous garland of flowers and foliage will adorn your table with a subtle poetry. The silver embroidery generates volume effects on the burgundy cotton. French fabrication. The napkins and the table runner are made of thick cotton canvas and the napkins are slightly darker. 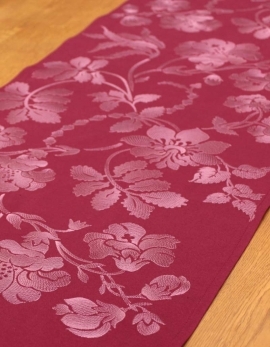 Table runner made with soft and thick pure cotton, burgundy colour, embroidered with silver color thread. Soft and thick burgundy cotton, embroided with silver color thread. Neat mitter corners. Made in France. 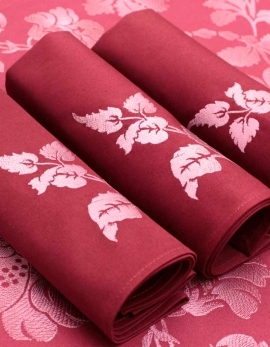 Napkin burgundy color is slightly darker than the table runner. Badam TS is a new designer of household linen, living in France and innovating through millenary traditions. His delicate and precious embroideries and his geometrical poetries made of ribbons are a pure dream for an equilibrated and original world. Selecting himself the sateen of cotton, percale of cotton, or pure linen canvas, Badam TS is fabricating his collection in France in order to reach rich perfection through the quality of the stitching process. Badam TS is offering to our bedrooms and dining tables with his bed linen and table linen a refined and original design mixing cultures and histories from Asia and from Europe. Badam TS takes his inspiration from traditional mongolian art, based on legends of nomads and magical landcapes whose colours change hour by hour with the shifting rays of the sun.